Docstoc, an online document sharing site that caters primarily to small businesses and professionals, is unveiling its first mobile app today with the launch of its iPad app today—Docstoc Premium. The iPad App, which is free, includes access to documents that are shared on the platform, including both premium and free content. 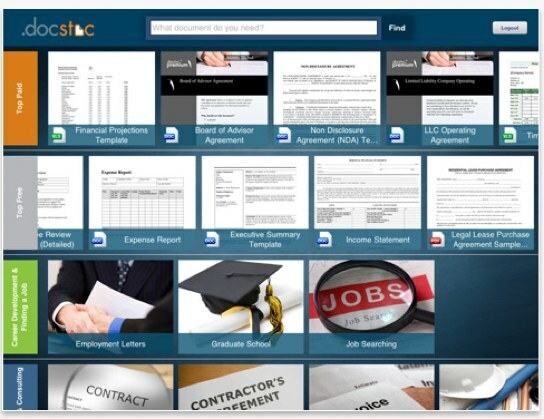 Users have access to over 10,000 business and professional documents, and can also search and download over 20 million library documents. Content includes company business plans, proposal letters, real estate purchase forms, LLC operating agreements, marketing plans,and more. You can also integrate your saved, bookmarked and uploaded documents from the web on the app through your account. Within the app, you can upgrade to access premium content (for $9.95 per month) from Docstoc . The startup has been making a big push towards premium content, launching a marketplace for professional documents, as well as books from premium publishers. 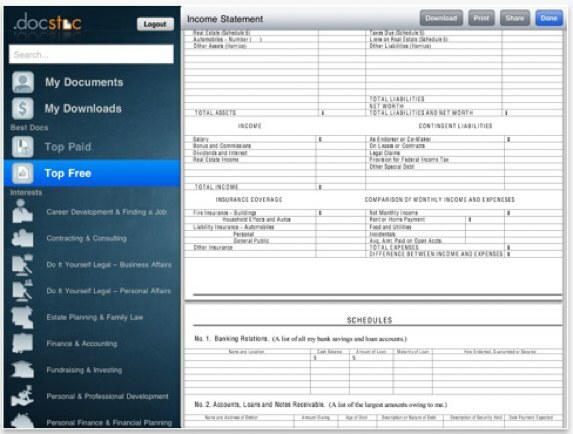 Docstoc co-founder Jason Nazar says the iPad app gives users access to over 3000-plus high quality legal and business contracts, forms, guides, and templates as well. This is actually Docstoc’s first mobile app, which is surprising considering that the startup has been around since 2007 (Docstoc launched at TechCrunch40 in 2007). But Nazar says an Android app is currently in the works and the company is ramping up mobile development. And the startup, which faces competition from Scribd and SlideShare, is growing in terms is usage. A year ago, Docstoc has around 3 million users and today the site has 11 million registered users.